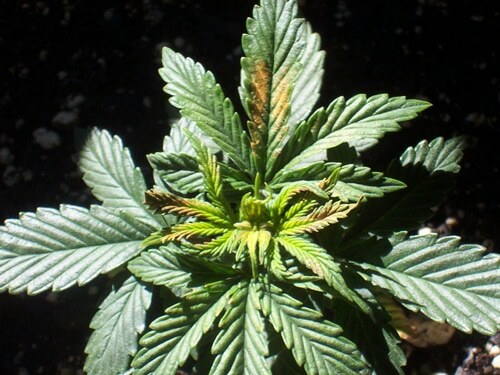 The first signs of a cannabis boron deficiency is abnormal or thick growth tips along with brown or yellow spotting on new leaves. With a boron deficiency, upper cannabis leaves display abnormal and/or slowed growth. Growing tips may not grow properly, may display twisted growth, and may die off. New leaves may wrinkle or curl. Plant roots can also be affected by a boron deficiency, showing unhealthy or slow growth. Stems may become rough or hollow. Boron deficiencies are more likely to appear when a plant is underwatered or experiencing very low humidity (very dry air). A plant with a boron deficiency may look like it has a calcium deficiency because boron is needed for the plant to properly use calcium. New growth is affected the most, and may look like it’s been burnt or scorched. A boron deficiency is often accompanied by an apparent potassium or nitrogen deficiency, as these nutrients are needed for the plant to use boron. Note: Sometimes a cannabis boron deficiency (like all deficiencies) can be triggered by stressful conditions and may clear up on its own after the period of stress is over. But the reason most growers see boron deficiencies is because boron is best absorbed at lower pH ranges. When the pH gets too high, your plant may exhibit signs of a boron deficiency even if it’s physically there near the roots. In soil, boron is best absorbed by the roots in the 6.0 – 6.5 pH range (in soil, it’s generally recommended to keep the pH between 6.0 – 7.0, but boron specifically tends to be best absorbed below 6.5). In hydro, boron is best absorbed by the roots in the 5.5 – 6.2 pH range (in hydro, it’s generally recommended to keep the pH between 5.5 – 6.5, but boron specifically tends to be best absorbed below 6.2). Boron is not absorbed well if there isn’t enough moisture, for example if plant is underwatered or humidity is very low (below 25% relative humidity in the air). Proper watering practices will help prevent underwatering, and a humidifier may be needed to achieve the best growth if your grow room is very dry. If you suspect your growing cannabis plant has a boron deficiency, flush your system with clean, pH’d water that contains a regular dose of cannabis-friendly nutrients. Old damaged growth will likely not recover. Watch plant over next few days to make sure that the problem stops spreading to new growth.